So, cards on the table? This is my favorite cover of the year. Actually, my favorite book design of the year full stop. The pages are all edged black, which is just exquisitely pleasing on a level I would never have expected, particularly set as they are against the blood red endpapers. I cannot stop touching them, even now that I'm done. The feathers and towers motif repeats itself throughout on each of the chapter title pages, and it is just a visceral pleasure every time. If you haven't picked up a copy in person, do yourself a favor and drop in at your favorite bookstore whether you plan on buying a copy or not, just for the treat of paging through this gorgeous book. That said, I feel it's important to point out that I was not a fan of Ms. Bardugo's Grisha trilogy. I crapped out partway through the first book, as the characters were just persistently doing nothing for me. 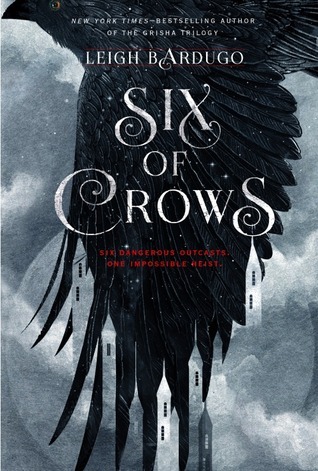 But when I heard Leigh Bardugo would be appearing at my local indie bookstore as part of the Six of Crows tour, something in me just clicked and I knew this book would be the one for me. A thread of evil is wending its way through the admittedly quite evil already streets of Ketterdam. Someone is forcibly administering a deadly drug to Grisha and using the wildly enhanced powers it induces until they're nothing but dried up husks. When the thread finds its way to criminal mastermind Kaz Brekker's shady door, he decides it's time for a little fun/profit. Kaz rounds up the six choicest of his ragtag thieves and thugs from the Dregs in order to pull off the heist of the century. Accompanied by Inej the Wraith, Nina the Heartrender, Jesper the sharpshooter, Matthias the convict, and Wylan the demolition man/flautist, Kaz plans to break into the fabled Ice Court and steal a very wanted man in exchange for rather a hefty sum. To be split six ways. Most of the gang have a reason or six to need their cut of the take; all of them have a reason trust Kaz. And so they agree (or have their arms sufficiently twisted) to take part in the insane scheme, despite (or perhaps because of) the swirling dynamics of resentment, hope, and hatred that pervade every aspect the group. Whether they make it out alive almost seems beside the point. Kaz Brekker didn't need a reason. "Were you trained as a dancer?" "An acrobat." She paused. "My family . . . we're all acrobats." "Did you work with a net?" "Only when I was very little." "Good. There aren't any nets in Ketterdam. Have you ever been in a fight?" She paused and then crossed her arms. "Every night." I love them. And if I fell in love with these two the fastest, it was only because they clawed their way in first. But I found myself enamored of all six of these hoodlums in very little time at all. So much so that it's difficult to talk about them, where they are now, and what might become of them, particularly Nina and Matthias. It's worth mentioning that the overarching issues remain unresolved at the wild and breathtaking conclusion of this volume. The sequel (it is to be a duet, a duology, a lovely two-book entity, what have you) is due out next fall, so getting yourself into it will ensure a fair bit of agony. But what are we bibliophiles if not up for a little drawn-out angst? I cannot imagine my reading year without this gem. It was the absolute highlight—young adult fantasy at its most entertaining, full of killer charm and a killer instinct. Like Kaz, I'm afraid I am all in. Come what may (and no doubt will), this ride is worth its weight in cold, hard kruge. No mourners. No funerals. Christina Reads YA - "If you were unsure or not much a fan of the Grisha books, giving Six of Crows a chance is a wise decision." Dark Faerie Tales - "Six of Crows is easily one of my favorite reads for 2015, and all-time. " Ivy Book Bindings - "I am so in love with all six of them, it's desperate." Love is Not a Triangle - "This book starts slowly, but speeds up as the heist gets going and the characters reveal more about themselves."